This is a sponsored review, I was invited to try this product in exchange for my honest review. All thoughts, opinions and expressions below are my own. If you're looking for a way to make trimming your dog's nails easier and safer, try doing so with a pair of Epica Pet Nail Clippers. 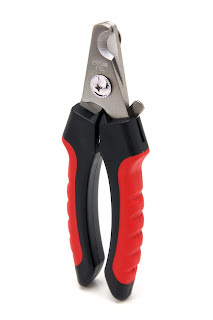 Made with high grade stainless steel, these durable clippers won't bend, scratch or rust, and the blades will stay sharp through many sessions on tough dog nails. Sharp blades let you work faster, with less effort, and cut the nail cleanly without ragged edges that have to be filed. Correct spacing of the blades is important for effective and safe use. These clippers are designed for medium and large dogs. Epica clippers can be locked with the blades in the closed position. This safety feature ensures that you won't accidentally cut yourself or damage the blade. Major hand strength is not needed to use the Epica clippers unlike with most pet nail clippers. The handles are shaped to fit your fingers and coated with anti-slip rubber making for a easy grip.